Discover the thrill of becoming a circus star! 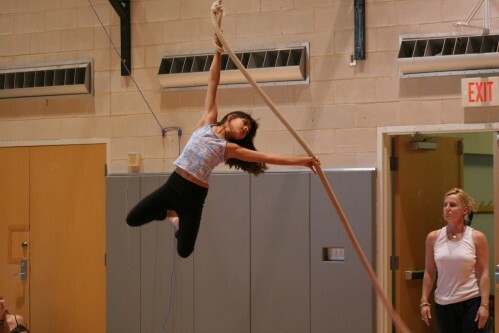 Lone Star Circus School summer camp is a day-camp experience designed to introduce children at any level of physical development and skill to the excitement of circus arts including aerial silks, aerial ring, trapeze, juggling, contortion, rolla bolla, trampoline, clowning and balancing. We inspire campers to discover their unique sense of creative expression by providing opportunities to reach new potentials and expand skills. Lone Star Circus is the performing arm of Lone Star Circus Arts Center, a Dallas-based non-profit organization, whose purpose is to promote circus arts through training, performance and community outreach. Its Founder is Fanny Kerwich, an 8th generation circus artist of French descent, who started teaching circus arts several years ago at Dallas International School, and in her own studio, The Expressionists. Lone Star Circus Arts Center was incorporated in 2006. Its circus school, Lone Star Circus School, organizes recreational and professional training in circus arts for children and adults. They also provide circus-themed entertainment for fundraisers and corporate and civic events. For more information about Lone Star Circus, visit their website: www.lonestarcircus.org, connect with them on Facebook or follow their tweets on Twitter.